Basic soldering kit for doing most anything on pinball and other arcade games. 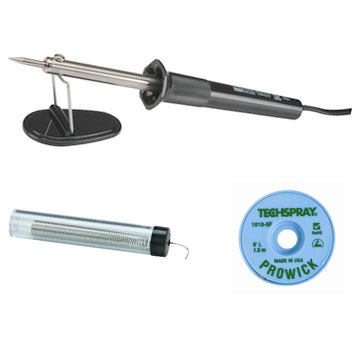 Includes 30-watt soldering iron, soldering iron stand, coil of solder, and de-soldering braid. Ideal for electronic circuit board work and general playfield/cabinet wire & connector soldering. A must for any pinball owner! Includes power cord with North America style plug (120 volts), replaceable tip, and portable stand.